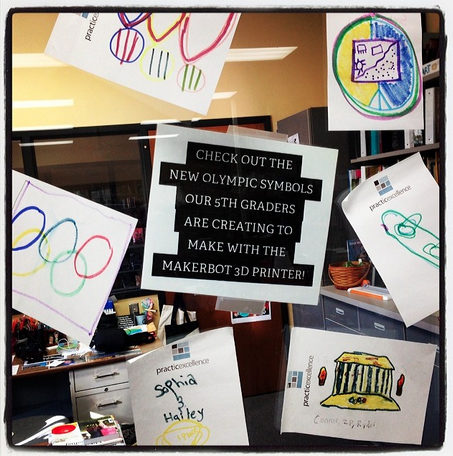 A Little Choice and Freedom To Create Brings Fun to Our 5th Grader Project 3D Olympics! 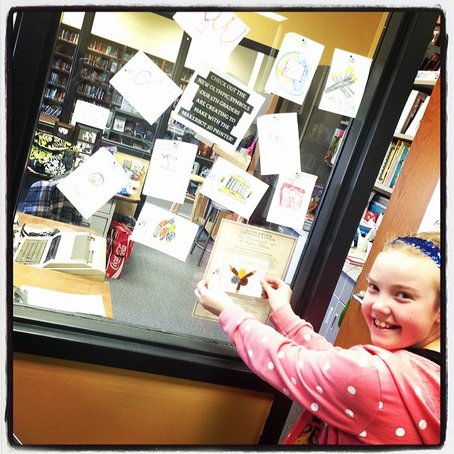 Today the 5th graders took over the library with excitement, creativity, and so much collaborating. They were given a choices and freedom to create.....this always leads to a whole lot of fun. 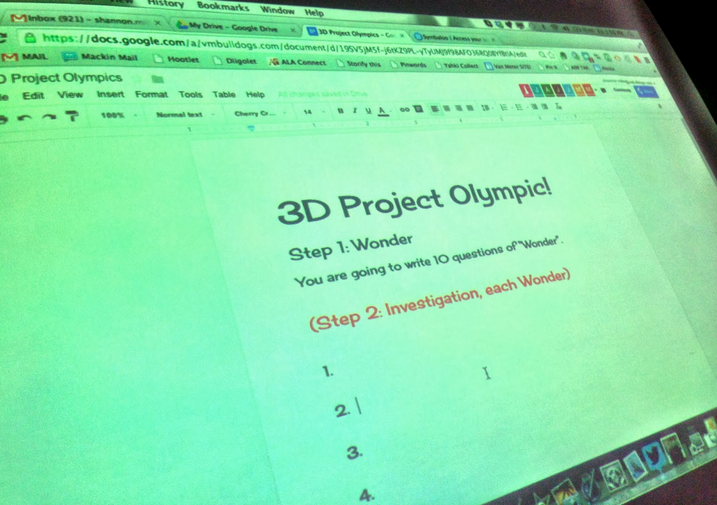 As you know they have been working on "Project 3D Olympics" for the last three weeks in the library. You can read all about the project here at this first post....And another from this week as they created their very own Olympic symbols. 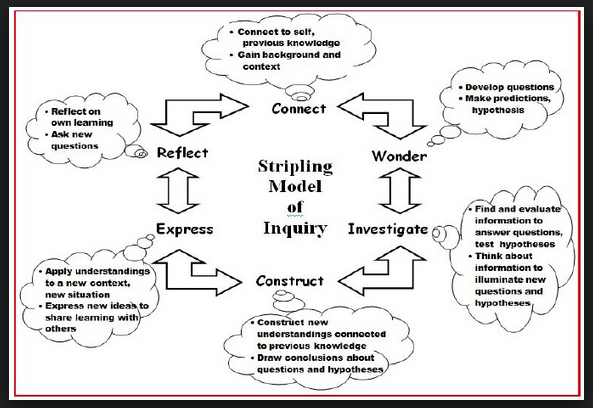 The 5th graders have worked through the "Wonder" and "Investigation" stage in the research project. Now it was time for them to move into the "Construct" and "Express" stages as they take the information and turned it into something unique and engaging. 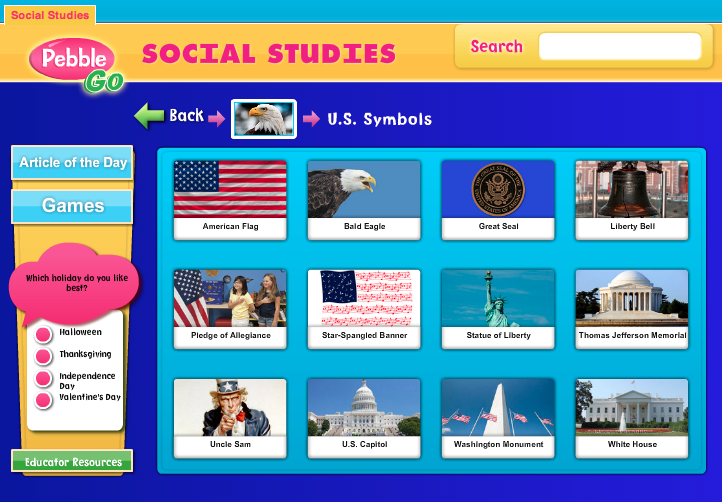 one or more of the digital tools in the "Web 2.0 Tools" Symbaloo webmix. As a class, we discussed several of the digital tools....Ones they have used, ones they wanted to use, and just ones they really wanted to try. Now they were brainstorming with their group on which ones would be a match for them. They LOVE having this freedom and choice! To be told they can pick any tools to showcase their research and knowledge is important to them and something they take very seriously. They couldn't wait to get started on their projects. The groups got out two computers or a combination of iPads and laptops. I love watching this because they were using one for the research and one for creating....it's fun watching them manage how they use technology too. 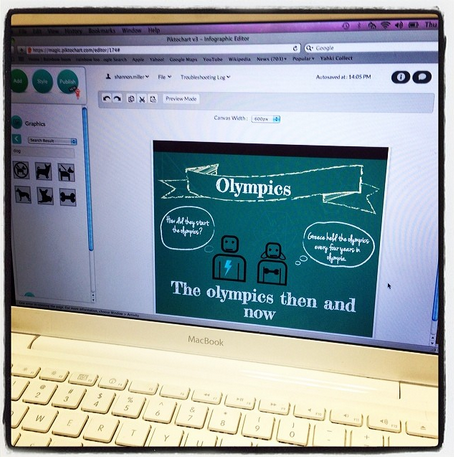 Josie, Kylie, and Lucy put together an AWESOME Animoto with their questions and research. Smore, Yahki, Haiku Deck, Google Drive, and more. As you can see, the 5th graders, and all young people, love having choice, freedom, and the space to create and collaborate. It brings so much to any community. 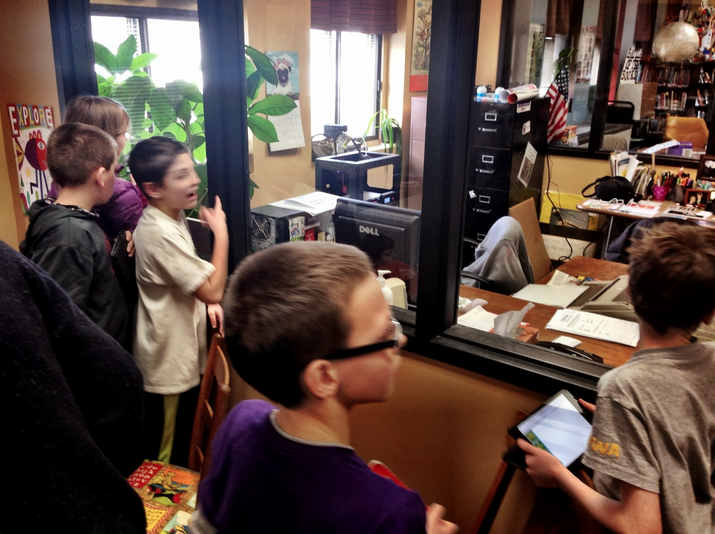 Stay tune....And just wait to see what they create next as they take their ideas 3D with the Makerbot! I meet a lot of really wonderful people through the social networks we are all connected through. Last week I had the pleasure of meeting Lucy Sanchez from PDF Converter Elite on Twitter. Lucy introduced me to PDF Convertor and I just knew I had to tell all of you about too. interested users around the world has rendered knowledge more accessible and attainable. computing and free cloud solutions, such as Dropbox, OneDrive (former Skydrive), Box and many others, have empowered us to back up and secure all our precious essays, presentations, reports or ebooks. That is how we all contribute to expanding learning resources and enlarging the world knowledge base. If we investigate our archived works and resources, chances are that we will realize that most of them are in Portable Document Format (PDF). The truth is that the format is excellent for archiving purposes, as well as for distributing and sharing them. It preserves the formatting of source documents and also enables everyone, on any operating system or device to open and view them. for a new slide deck. What to do in such cases? Luckily, the Internet and its champions offer solution to this problem. The best solution to deal with unrelenting and unchangeable PDF is to transform it to another, editable format like Microsoft PowerPoint, which most presenters are well acquainted with. In order to do that, we need a PDF to PowerPoint Converter. It doesn’t even have to be expensive, as there is a completely free online PDF to PPT conversion service. This nifty service allows you to upload your PDF slideshow and get it converted in minutes without any effort on your part. ● Visit the web address of the tool. your local drive (it can also be a Dropbox, OneDrive or other cloud service’s desktop client). ● Enter the email address to receive the download link to your converted PPT slides (Step Two), ready for editing and brushing up. If you tend to worry about giving away your email address to online service providers, don’t worry: the PDFConverter.com (the tool provider) extends full guarantee that each email address and its privacy are fully protected, as well as the contents of the uploaded files. The PDF to PPT service is reliable, accurate, quick and very easy to use. And on top of it, it is free. It is good to keep in mind that the maximum size of an uploaded file is 2MB. All converted files should be downloaded within 24 hours, as the download link expires after that time and files with adjoining email addresses are permanently deleted from PDFConverter.com’s servers (in order to maximally protect the privacy of users and their files). Even though presenters most often deal with PowerPoint and PPT (PPTX) format, it doesn’t hurt to mention that the same provider offers three more PDF conversion options: PDF to Word, PDF to Excel and Create PDF. They are also fully free. All these separate online tools can be accessed from the page of PDF to PowerPoint converter. These four simple tools should satisfy most PDF management needs of an individual presenter or librarian organizing and managing their own digital libraries. You can find them on Twitter and Facebook too. 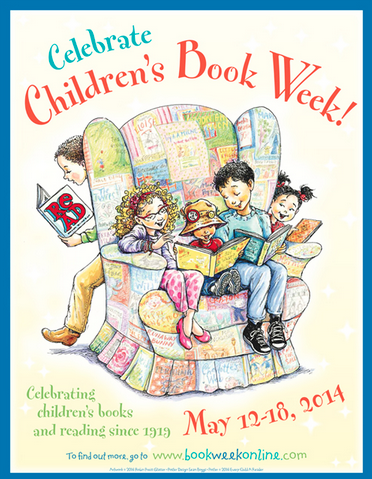 Excited To See The 2014 Children's Book Week Poster and Bookmark Announced! 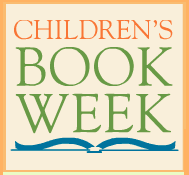 Every May we all get excited to celebrate Children's Book Week with our friends at Van Meter and around the country. This year it is May 12-18th. The Children's Book Council and Every Child A Reader sponsor Children's Book Week and do an amazing job getting all of us connected and excited about the event. 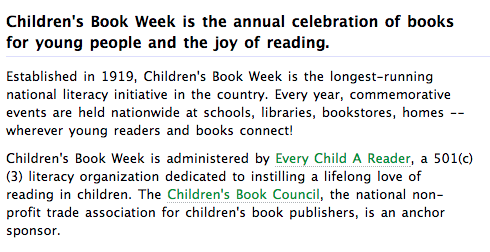 It is also fun to follow the Children's Book Week count down on the front page of their website too. 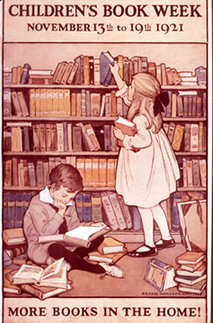 Since 1919, we have been celebrating Children's Book Week (read more about it here). And each year there is a poster created commemorating the special week. I am always super excited to see the illustrator who creates the poster and bookmark. This morning they were announced! 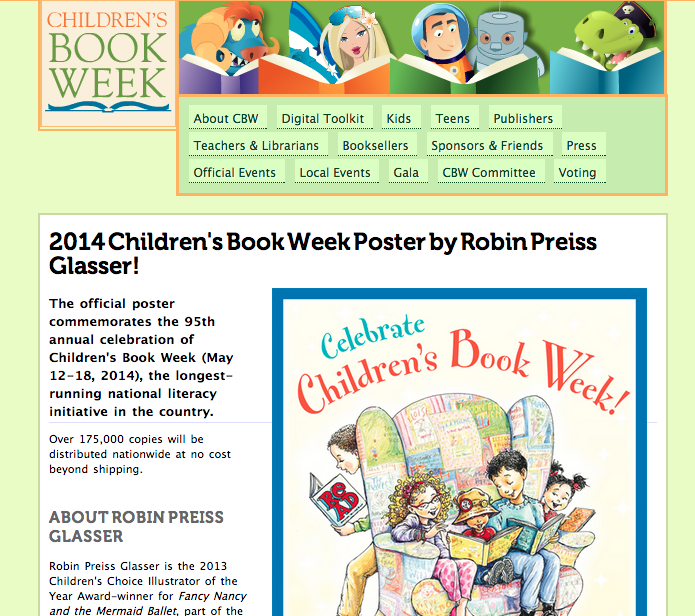 The poster this year was created by Robin Preiss Glasser, illustrator of Fancy Nancy and others. 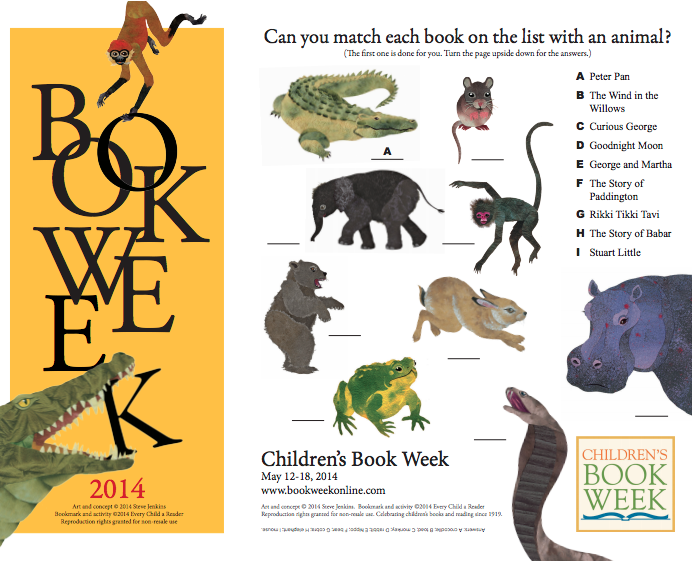 What an amazing poster Robin has created for all of us to celebrate Children's Book Week! I always order as many as I can because the teachers love putting them up in their classrooms to celebrate Children's Book Week and reading all year long. You can go to this page to order your free poster too. 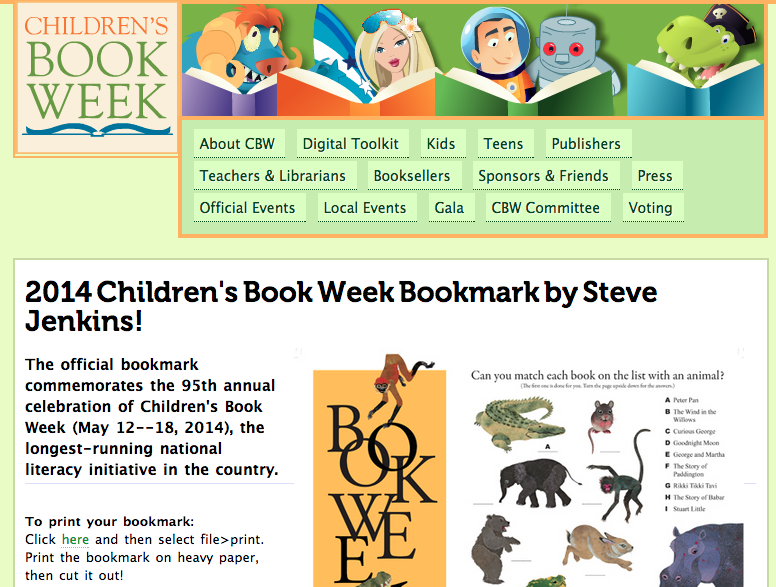 I was also very happy to see that Steve Jenkins created the 2014 Children's Book Week Bookmark! I recently got to meet Steve through an interview I did with him about the Common Core State Standards. He is doing amazing work and adds so much to the world of our young people through the books, writing, and beautiful illustrations he created. Next week we are all getting ready to celebrate LitWorld's World Read Aloud Day together. And then we will be planning for Poetry Month and Children's Book Week. Always so much fun! What Was All That Singing About Coming From The Library & PebbleGo Today? If anyone walked by the library today when the kindergarteners were here they probably thought they were at a baseball game. From the walls of the library were beautiful little voices singing The Star-Spangled Banner at the top of their lungs. Oh.....and there was a tiny bit of dancing and even some acting to accompany this song. Last week when we started researching the Presidents in Capstone's PebbleGo to celebrate President's Day, the kindergarteners also explored the other topics and articles within this database. They even used FlipGrid to talk about the Presidents job too. They love learning anything about our country so it was exciting for them to find the Star-Spangled Banner during their exploration. And just as they found the video of someone singing, almost twenty little voices starting singing coming in at different times, volumes, pitches, and speeds. It was totally spontaneous, crazy, and one of the cutest moments in the library with them this year. That was just the start to their exploration in PebbleGo Social Studies. They found several other articles they were excited about too. They learned about The Pledge of Allegiance and so much more. 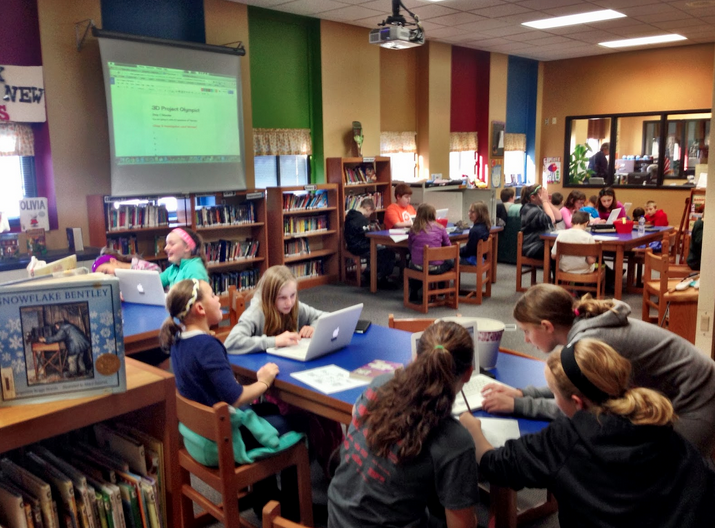 Over the last few weeks our 5th graders have been researching, collaborating, and creating in the library. Their focus has been the Olympics as they develop their own questions to guide their research and create a project that shows what they have learned. 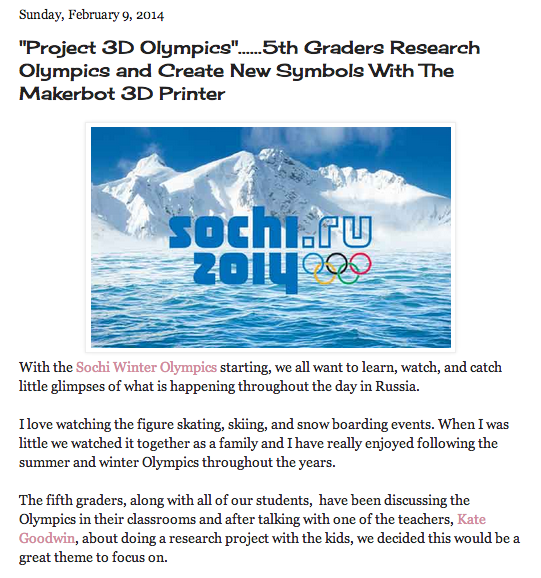 In the post, Project 3-D Olympics ....5th Graders Research Olympics and Create New Symbols With The New 3D Makerbot Printer, I outlined about the project and steps we will be taking. They are having a great time working on the wonder and investigation stages of research. The last question they will answer is one we wrote together as a class. We decided that after they researched the Olympics, each group would create a new Olympic symbol and support the reasons why. Each group couldn't wait to get this point of the project. It was really fun seeing how excited they were to create something new and unique. 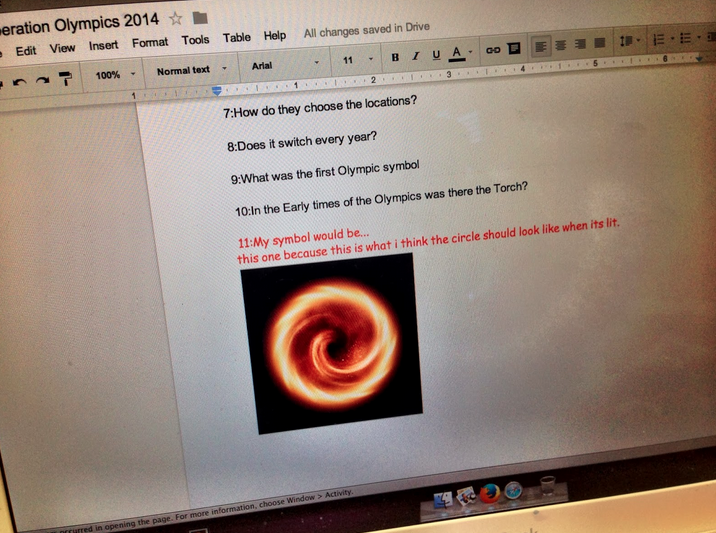 I love watching what they researched as they created their new Olympic symbol. The thoughts they develope as they collaborate and create really lets them shine in an unique way. Gavin, pictured above, is passionate about the snow boarding in the Olympics....and snow boarding himself. His group is going to create a new Olympic symbol that includes a snow board. 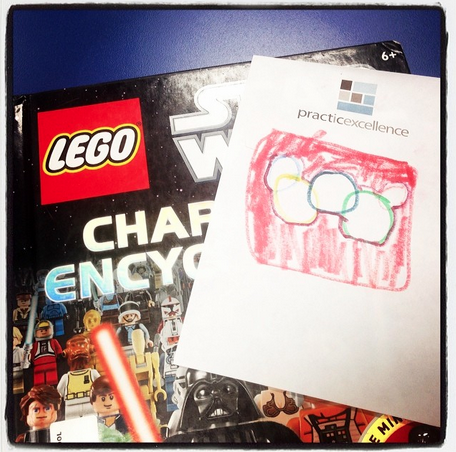 Jonathan and Beau have a passion for LEGO's. Their new symbol is going to include a red LEGO with the current Olympic symbol on the top. Collaboration with each other within their group and the entire class. Also, sharing these projects within our school community and the world. Connecting to resources, knowledge, and places that will help them with their project. Creating something new and unique to them. 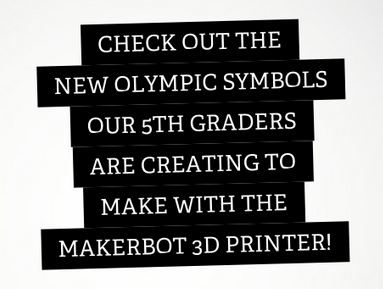 Something they are proud of and will learn how to create in the MakerBot 3D printer. Next, they will start using Tinkercad and Blokify to create their symbols and get them ready to print with our MakerBot. I can't wait to share the next steps too. We are going to have a lot of incredible creations. 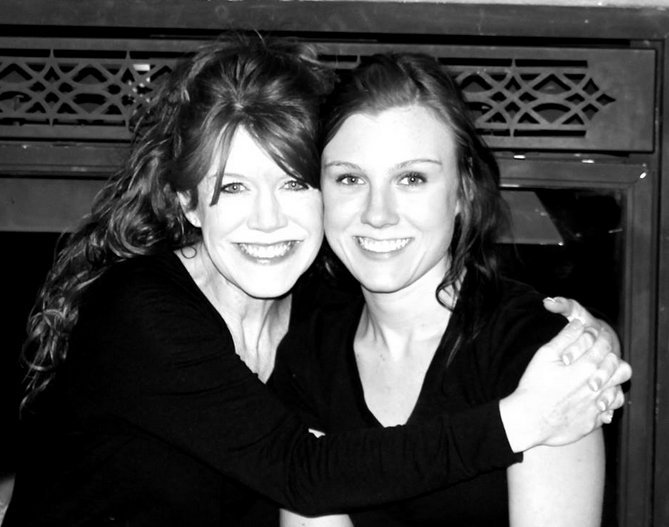 As we celebrate week two of the World Read Aloud Day "Raise Our Voices" Blogging Challenge, I am in North Carolina visiting my favorite girl and friend in the world, my daughter, Brianna. I have always loved to share reading, books, authors, and illustrators with Brianna and my other two, Brady and Hagan. It was fun to talk about the blogging questions with Brianna as we wrote this post. For the week 2 of the WRAD "Raise Our Voice" Blogging Challenge, you are to answer the following questions with a child. The child can be a student or your own. Age does not matter. 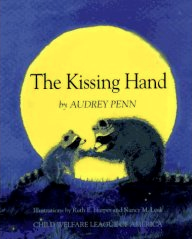 The Kissing Hand, my mom read to every day to help me get through school. I was very sad to leave everyday so that helped when she read it. 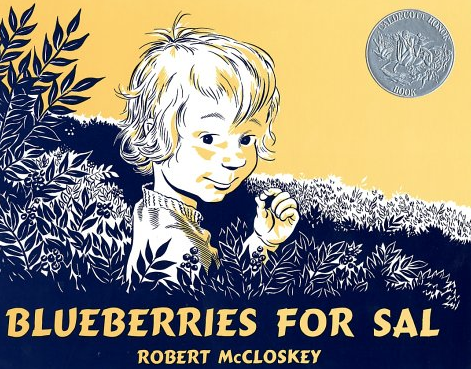 Blueberries for Sal and Make Way For Ducklings....my Grandma read them to me when I came to visit. These were my favorites at her house. 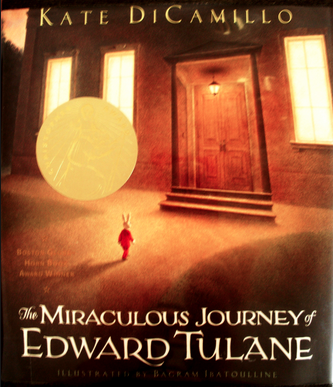 The Miraculous Journey of Edward Tulane, I read this in 5th grade and made a shadow box with Mom. We made a small mouse out of clay holding a giant needle. There is a perfect fit for everyone, but not the same from person to person. We talk a lot about this in the library and that is one reason we do so many book talks and sharing at all ages. I would never recommend just one book for everyone. But I do love hearing what everyone loves to read...this always gives me more and more ideas as well. 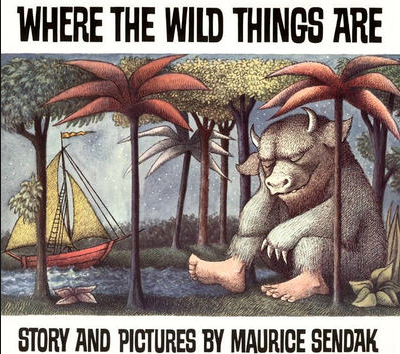 One of my favorite books, that I do love to share with all of the little people in the library, and one my mom read to us a lot, is Where the Wild Things Are. 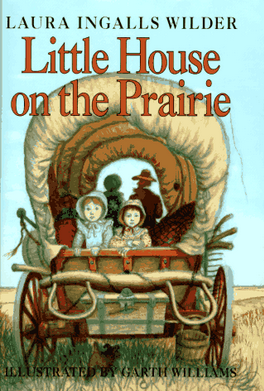 And my favorite series was all of the Little House On The Prairie books. I read this over and over again. Brianna... I would listen to my Grandma read aloud to me like I did when I was little. Me...I love listening to my Mom read aloud too....especially to my own children. I would love to listen to my Grandma Hazel read aloud to me one more time. She passed away almost two years ago now and I miss her very much. I grew up right down the road from my Grandma and spent time with her every day. She would read to me while I ate one of her sugar cookies. I wish I could do that today. Me... I always have loved reading aloud...as soon as I was pregnant with Brianna, I started reading to her. It has been so fun to read aloud to all three of my kids and nieces and nephews too. Being a teacher librarian, I get to read to the little people in our library all the time too. One of the best parts of my job! 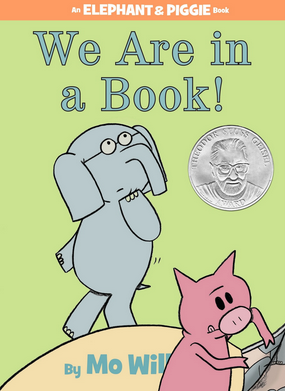 My associate Diana and I love reading the Elephant and Piggie books my Mo Willems together. These are so much fun....everyone laughs and has a great time. Brianna....I love to read but my favorite genres are mystery and adventure. 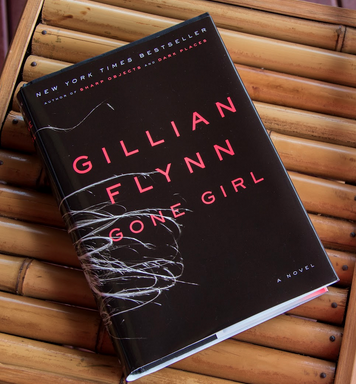 My favorite author right now is Gillian Flynn. My mom and I got Gone Girl and that was one of the first real adult books I read. I love the way she writes and her books keep you on the edge of your seat. Me...I love picture books and these take up the most room on my book shelf. Every time I find a new picture book, I am excited and happy that I will get to share it with others. This weekend I found several new picture books that I bought. 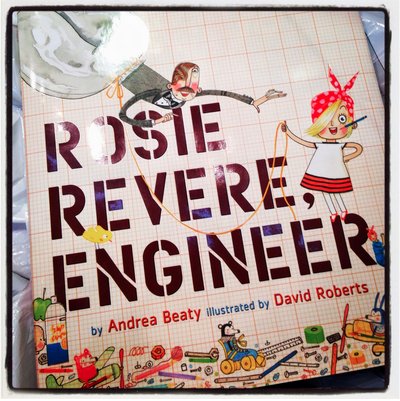 I am most excited about Rosie Revere, Engineer. I can't wait to read this one aloud all week to the kids in our library. Brianna...I think being read aloud to is relaxing. Me... I love being read to because I just let the words take me into the story. And the same when I read aloud. It is so much fun seeing kids happy and excited about listening to a picture book. Or when you are reading a novel to an older child and the suspense and care in their face....It is always an emotional experience. One that we are all so lucky to experience.